Kat and I made some pull-apart drop biscuits last week, and while they were delicious, at the end of the night, she and my entire kitchen were covered in flour. How I managed to escape the flour storm is a mystery, but in any case, we were left with a huge pile of bowls and trays to wash. Isn’t the whole point of drop biscuits that you can whip them up in a pinch? Hence, I came up with this one-bowl, no fuss recipe. 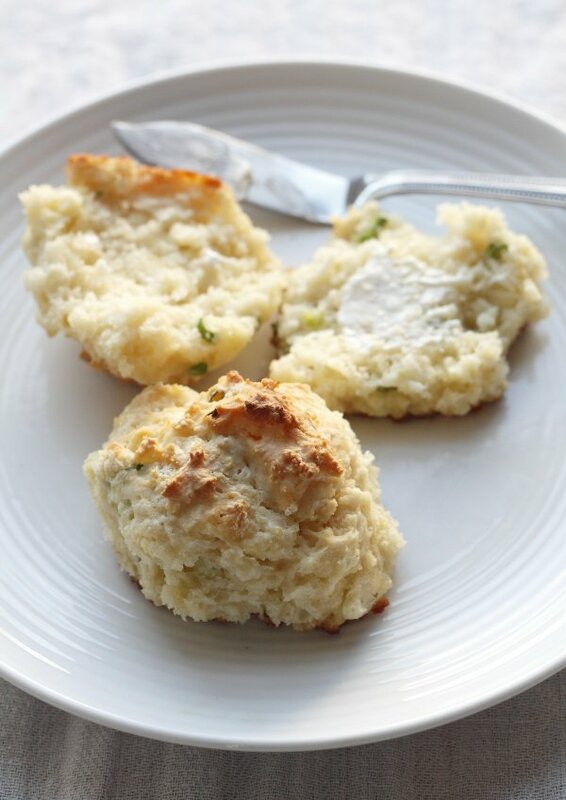 These are savory biscuits that are easy on the butter and subtly scallion-flavored. They are best eaten straight out of the oven, when the top and bottom crusts are deliciously crunchy and the inside is tender, moist, and fluffy. Feel free to brush the tops with melted butter or break them open and spread butter on the inside, but for the most part, I eat these plain, and they’re good just like that. After a day, you’ll need to toast them to bring back the crunchy outside and soft inside. A toaster oven set between light and medium works best. 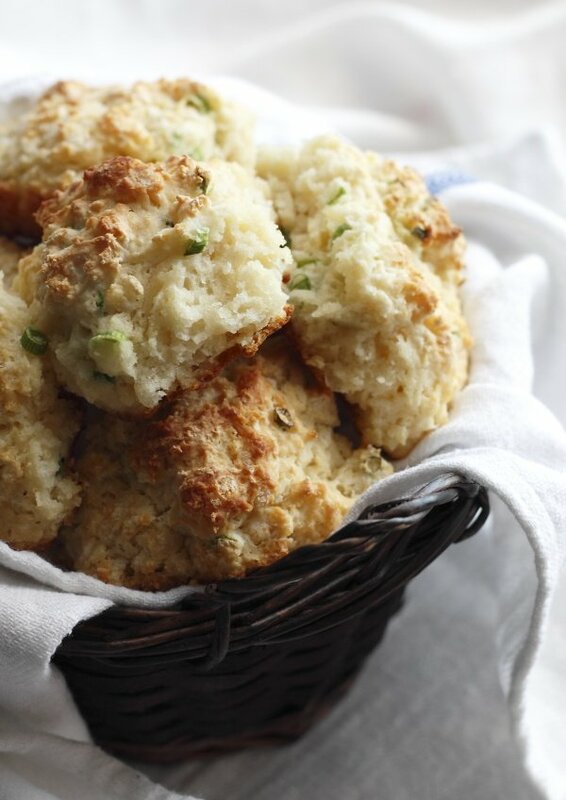 These are savory biscuits best eaten fresh out of the oven. Store leftovers at room temperature in an airtight container. Reheat in a small toaster oven between the medium and light settings or in the oven at 475°F for 3 to 4 minutes. Place an oven rack in the upper third of the oven and preheat oven to 475°F. Generously butter a 9-inch cake pan or cast iron pan. In a large mixing bowl, whisk flour, baking powder, baking soda, salt, and sugar together. Using a coarse grater, grate in one tablespoon of butter at a time, tossing it into the flour mixture with a fork each time. Sprinkle in the scallions. Pour and fold buttermilk into the mixture just until it's incorporated. Work gently but quickly and do not overmix. The dough will be shaggy and sticky. 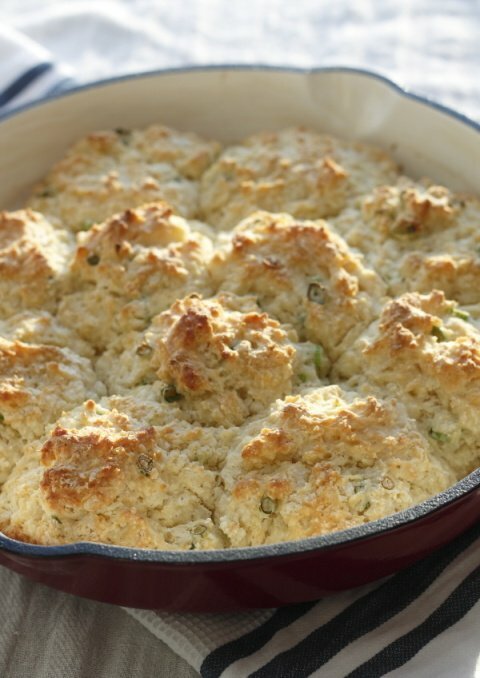 Using 2 large spoons or a 1/4 cup scoop, drop 2-inch diameter balls of dough into the pan, spacing them about 1 centimeter apart. Place them in a ring around the edge of the pan first, then fit the remaining ones in the center. Bake 15 minutes in the upper third of the oven or until golden brown on top. 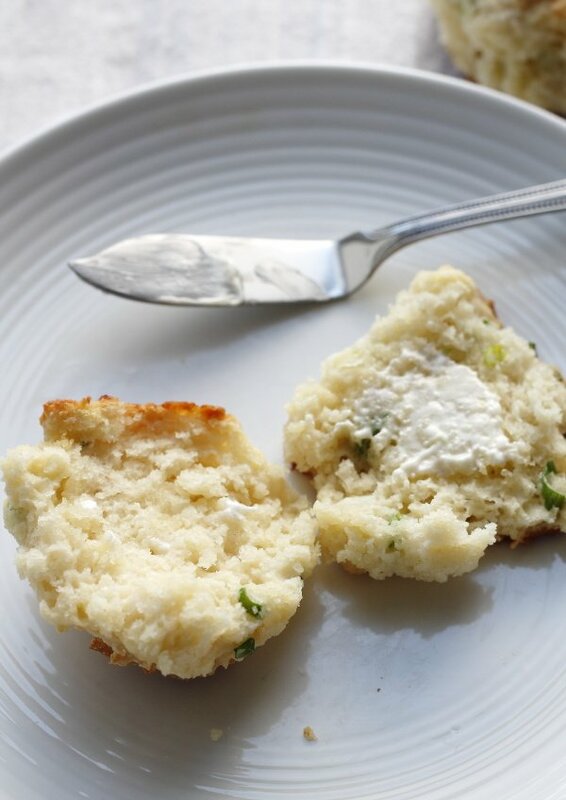 Slide or flip the biscuits out onto a wire rack. Cool for 5 minutes, then pull them apart and serve immediately.